April 2013 - Deb Arnold, Ink. 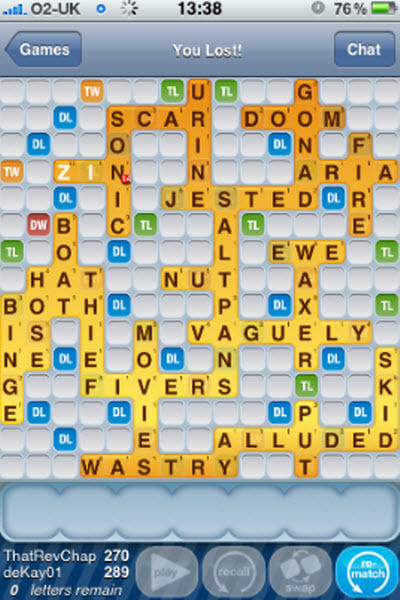 Does Words with Friends Make You Smarter? Lord, I do hope so. The popular app and scandalously obvious Scrabble copycat gets a lot of attention from me. No Angry Birds for this word girl. Increases my vocabulary, especially two- and three-letter words. Ensures that my mind is not left idle for even one blessed minute. Connects me with my uncle in Knoxville, my cousin in Atlanta, my b-school classmate in LA, a childhood friend in NYC, a family friend in Chicago, etc. Love that chat functionality. Hones my competitive nature – critical for award wins. OK, I don’t know that it’s more “beneficial” than any other game, but if you’d like to play, look me up.